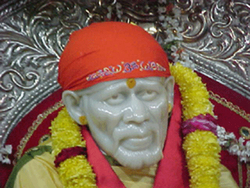 Sai Baba's grace is well known for fulfillment of the wishes of His devotees. 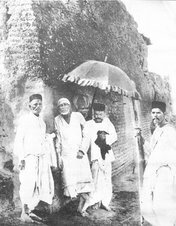 While Sai Baba sported in physical body in the sacred land Shirdi, miracles where everyday happening in Shirdi and with His devotees, at far away distances from Shirdi. 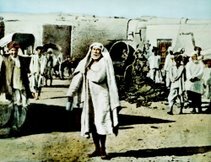 Devotees felt and knew that Sai Baba's grace was following them wherever they went, and knew whatever they did. It is so even today. 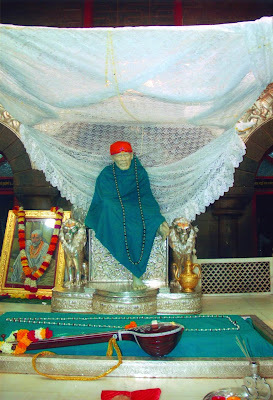 Initial attraction for most people and devotees towards Shirdi and Sai Baba was due to this miracles, as it is today. 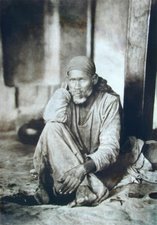 Stories were herd that in presence of Shri Sai Baba, a Fakir in Shirdi people would get free from all sort of problems like mental anguish, physical ailments and long stubborn sickness which refused to leave in spite of much medication and other efforts. This things happened on daily basis with many devotees. 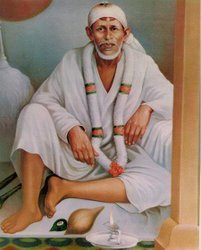 People anxious to get rid of their mental, physical and social problems would visit Shirdi and get rid of them adding to more stories of the power and compassion of Sai Baba's grace. There were very few seekers of spirituality or God who were attracted to Shri Sai Baba, or perhaps those stories are few on records for devotees to read. Many devotees who got rid of their problems again and again with Baba's grace were slowly diverted to spirituality and love for God. About the grace so powerful, always anxious and following the devotees, protecting them and guiding them and leading them to the comfort of spiritual peace, silence and compassion. Giving so many things to the devotees. There is a line in the famous Arati of Shri Sai Baba called Aarti Sai Baba writen by Madhav rao aadkar. meaning whatever feelings or bhaava one has, Sai Baba gives one the same. Whatever one wishes one would get. (Though not in all cases. Sai Baba also acts as a loving mother and would not give something if it was harmful for the devotee's spiritual progress.) Such powerful grace pulling hundreds and thousands of devotees to Shirdi and other temples. Making devotees chant his mantras, perform Aartis and other form of devotion. Most devotees still do it for the purpose one or the other. 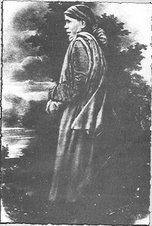 I remember a parable told by Shri Ramakrishna Paramhamsha in the holy and sacred book Gospel of Sri Ramakrishna. There was a tub filled with a dye. People would get their clothes dyed in the color they desired (Jaisa mani Jaisa bhaav taya taisaa anubhava). Somebody would desire the cloth he brought to be dyed in blue color and would leave happily with a blue colored cloth. Some one with green, yellow and so on. some would even make a habit of coming again and again with the cloth for different colors at different times. One man watching all this asked for the dye. CAN YOU TELL ME FROM WHERE I CAN GET RAMVIJAY BOOK WHICH SRI BABA HAD REFERRED TO MANY OF HIS DEVOTEES TO READ?? I am not aware i tried google searching for the same with variations but could not find it. Try at local book shops which sells sacred and holy books. hello I tried to ask a question and baba said readram vijay.Is it good to read the book.Because in Sat charita baba asked people who were about to die to read that book. I am scared.Why did baba give me that reply,Has anyone got that reply? i do not know how you asked the question and how you received the answer. Best way to get an answer is reading Shri Sai SatCharitra. The more I read about SAI MAA,the more I feel the presence of SAI MAA.Remain with me always in all odd and even. baba you know how much i and my soul suffers from fear and depression.baba i am not able to do job because of my depression and people fear.if i talk to my family mambers than they say, it is nothing and they treat it as normal. baba whenever i go in public i have a people fear in my mind. i am not able to talk to them freely because i have people fear in my mind. now my parents are searching for guy to marry me.baba i fear that due to my people fear what will happen of my future.somtime i fear so much that i dought that i will be able to survive in this fast going world or not. 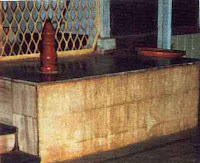 baba i need your blessings so that my past sins of this and previous birth my be washed by your holy name.baba however one day i had seen a positive sign. it is that when guests appeared at my home i was very frightened.than i chanted in my mind and heart your holy name and i became feareless.i think that in this world no one can cure my disease except you..baba i am becoming responsible day by day.but still my guilt ,my depressionand my people fear surrounds me.baba i need your blessings to remove my fear and give me a soulmate who understands me and would not leave me in my depression. baba you know i amvery faithful and will keep my soulmate happy.so please bless me with a fearless life and a very strong hearted soulmate. baba i came to you with very much expectation.baba if i were a boy i would not had planned to marry because im very fearful but i am a girl and i cant choose to live without marrige because living in this world witout marriage for a girl is quite hard..please give me agood soul mate. i promise you to be honest in my relationship and also towards your teachings baba. i surrender.rest it depends on you. Baba mujhe jald-se-jald job dila do ab or nahi saha jaata, plz or mujhe kuch nahi cahiye bus ek acha sa job dila do. People fear can be handled by seeing a doctor or thru meditation and prayer regularly. The best way to overcome it is to go out and talk to people as regularly as possible. Stop thinking about what they are thinking about you. Try not to care too much about opinion. I say all this because I suffer from the same and I am being treated for it by a doctor. But his advise to me is that I should calm down and pray and meditate all the time. 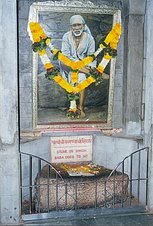 Read about Saibaba. There are so many hundreds of books on him. Chant his name all the time. Carry him in your pocket. Love him and keep talkng to him. He is wonderful. He responds to me all the time. He doesnt give me all I want, but he never fails to respond when I ask for help, even in little issues everyday. He is a very kind father. And the truth is He is God. 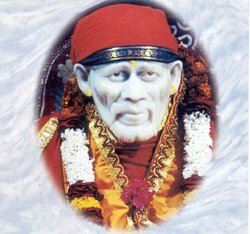 BABA PLS BLESS ME & SOLVE MY FINANCIAL DIFFICULTIES. Baba ayudame a ayudar las comunidades en la selva, enviame empresas para hacer reforestación. iluminame, dame las fuerzas y voluntad para hacer el trabajo de conservación.permita que la vision que tengo con tu persona perdure eternamente y que se realice, aún no siedo conciente. Amor y alegría en el corazón de los hombres. Con infinito amor y agradecimiento por conocerte.